For the first printing of the backers, there is a Chubby Spinner Correction. Ignore if your diagram matches the one below. The second diagram has an error in it. The tools should not rotate for the Spinner. See the diagram to the right for the correct layout of your strip sets and tool. Were do I get my 12 Degree Tool? The 12 degree tool is only found in the pattern Butterfly in the Round. So many free patterns make this a great value! 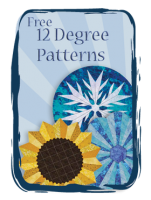 Framing template for the 12 degree patterns. Are there corrections in the Mariner's Compass pattern? You will need 2 29" squares for both the Twin and Queen/King quilts. The Framing template from page 6 and 7 is downloadable here. The book looks overwhelming. Where do I begin? This is indeed an odd technique, yet it does work. It’s just different from most quilting methods. I suggest you begin with a small project--a table runner or even a one block wall hanging. Use some muslin or fabric from your stash to learn before cutting into your “good stuff” or starting a big project. You need to follow the book step by step. 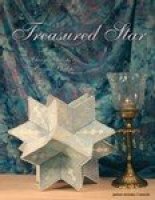 Its not one you can flip through and do without referring to the book. Even though it seems like a lot of details, when you walk through the process, you‘ll find it works great. Can I buy just the arc tool? No, you will really need the book for the process. Diagrams are provided for each step, often two diagrams so you can see both the front and back view. For those of you who have misplaced your arc tool, we've recently found a box of unprinted tools. These will come with a paper template so you can transfer the markings onto the tool. Why do I cut the batting square a smaller size than the drawn square and the interior square? Cut your batting 11 1/2” square. The batting square is smaller to compensate for the fabric taken up in folding and in the seam. Cutting directions are found on page 29. What are scallops and when are they added? The curved edges of the quilt are the scallops. These pieces are added to the blocks in a similar fashion to the way the blocks are joined together. When we make a wedding ring, we choose to do the scallops first. Although this is our preference, you may find it easier to learn how the blocks are assembled before trying the scallops. You’ll find the scallop instructions on pages 33-36, and block assembly on pages 37-40. Why does it take so much fabric to make this quilt? 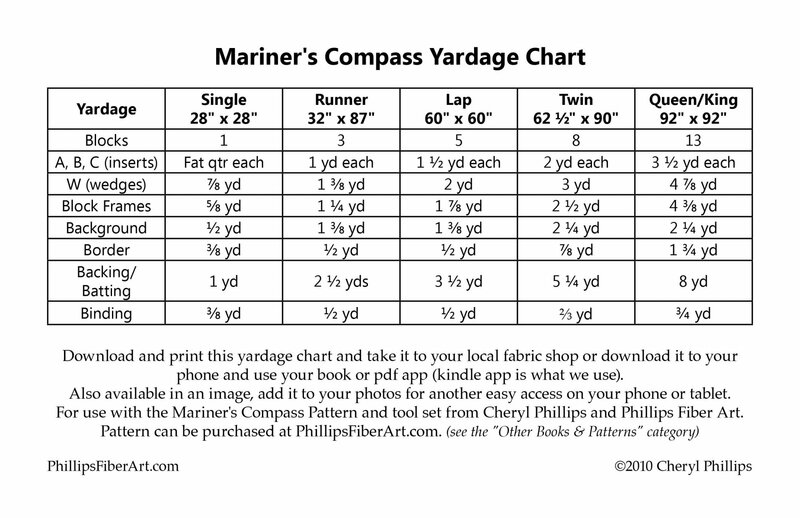 When you’re looking at the yardage charts, remember the amounts are for both the front and back of your quilt. The backing folds to the front side from the back. Also keep in mind, circle designs are probably not the most efficient use of fabric. I want to make king size. How do i do this? -Start from the center and sew 2 rows together. Basically going back and forth sewing rows to each side of the center row. This will make it so you can sew down each arch as you go. Much easier than waiting until the end. 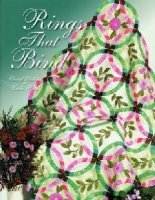 So many Creative Options for the Rings That Bind Techniques! We have 8 additional pages to offer! Click on your choices below. Timtex is a heavy, thick stabilizer recently used inside fabric bowls. It was originally developed for hat brims, so it’s good and sturdy. I have used heavy interfacing (it was a bit too flexible for my tastes) and even cardboard (this was what was used in the antique one--about cereal box thickness). What are the two tools included in the Wedgeworks II book? An 11.25 degree wedge and an insert tool are included in the book. Thirty two wedges make a circle. You can make Mariner’s Compass blocks with 16 or 32 points. The insert tool makes the points. What makes the Wedgeworks II technique different from other Mariner’s Compass blocks? Rather than setting in points with difficult Y-seams, the points are made by folding fabric and sandwiching it between wedges. The folded pieces are then opened to form the points. What is the difference between Wedgeworks I and Wedgeworks II? Wedgeworks I has a 15 degree wedge included in the book. Twenty four wedges are sewn together to make a circle. There are fifteen designs in this book. One design, the Sunflower Seed Packet was featured on episode 313 of Simply Quilts. The Wedgeworks II book has two tools included, a 11.25 wedge and an insert tool. Wedgeworks II makes a 3-D Mariner’s Compass. Which one is easier, Wedgeworks I or Wedgeworks II? One isn’t easier than the other. They’re about the same in degree of difficulty. Choose whichever appeals to you, or try both. 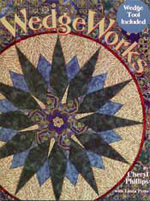 Is the Wedgeworks II Mariner's Compass book still in print? Watch our Bargello Color Wheel video demonstration. 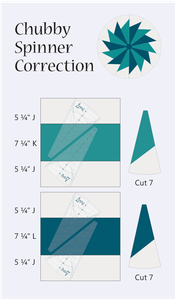 The diagram for Cutting Strips is labeled incorrectly. The diagram should state each section is 14" and not the whole piece. I am confused about making the figure eight swirl. We have changed our technique as of 2013. 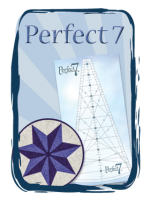 If you purchased a pattern before then download this addendum. If you purchased after 2013 please use the following correction pages. Download these labels to help you keep your strips and pieces organized! Is there a free pattern for using the Color Wheel Bargello wedge? What angle is this wedge tool? It's a 15 degree wedge and makes a 27" circle.